When brewing beer, its critical to quickly cool your brew before adding yeast to minimize the chance of infection. Today we look at the advantages of rapidly cooling your wort after boiling, and also how to build a simple immersion chiller using copper tubing purchased from your local hardware store. Rapidly cooling your wort after boiling can significantly improve your finished beer’s clarity and flavor. Reducing the chance of infection – your wort is vulnerable to bacterial infection when it is warm and has no yeast added. You want to minimize the chance of infection by cooling rapidly and pitching the yeast as soon as practical. Improved clarity – When you rapidly cool hot wort, many of the heavy proteins and tannins will no longer be soluble and will fall out of the wort. Siphoning the wort off of this “cold break” will result in a improved clarity and improve taste as well. Reduction of volatile compounds – Dimethyl Sulfide (DMS) which gives beer a strong “”sweet corn” flavor can continue to break down after boiling and may be carried forward into the finished beer unless you rapidly cool the beer (Ref: Brewers Handbook by Goldhammer). Quickly cooling 5-10 gallons of boiling hot wort does present some problems for the home brewer. Ideally you would like to reach fermentation temperature as quickly as possible, though something in the 10-20 minute range is acceptable. Commercial brewers use elaborate two-stage heat exchangers with a glycol coolant to achieve the final fermentation temperature. Often beginners immerse their entire boiling pot into a tub full of ice water. This can be an effective method, but it typically takes longer than the methods listed below, since heat can only be transferred through the hot pot itself. 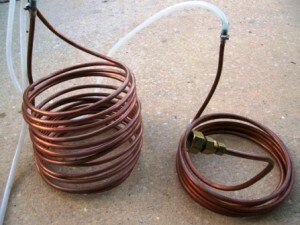 The simplest solution for most homebrewers, an immersion chiller (pictured above) is a coil of 30-50 feet of copper tubing that is immersed in the hot wort in the pot. The tubing is connected to a sink or garden hose and cool water is continuously run through the chiller to cool the wort. Since 50 feet of copper tubing has a large surface area, 5-10 gallons of wort can be chilled rapidly using this method. Immersion chillers may also include a second stage, consisting of an additional coil before the main coil that is immersed in a ice water bath to lower the temperature of the water as it goes into the wort. A two stage immersion chiller cools even more quickly and helps in cases where the tap water going into the chiller might be at or near the desired fermentation temperature. Immersion chillers are also very easy to make, as described below, and also easy to clean since the outside of the coil simply needs to be wiped down and washed after use. A counter-flow chiller is a coil that contains two tubes of different diameters, one placed inside of the other. Cold water is pumped through the outer tube while the wort is siphoned or pumped in the opposite direction in the inner tube. Counter-flow chillers are extremely efficient and can cool wort very quickly. The only downside for homebrewers is that they can be more difficult to clean and sterilize. As soon as you finish using a counter-flow chiller, you need to flush it rapidly with hot water and run cleaning fluid through it. Also it is a bit harder to construct a counter-flow chiller at home. An immersion chiller (shown in the picture above) is simple for the average brewer to construct and maintain. The basic materials can be bought at the local hardware store and assembled in about 30 minutes. Start by making a large diameter coil from the copper tubing. Make the coil small enough to fit in your boil pot. The best way to form the coil is to wrap the tubing around a large coffee can, bottom of a corney keg, or other large cylinder. Leave both ends of the copper tubing sticking up above the height of your pot, and bend them 90 degrees so they extend horizontally over the edges. On one end, attach the fittings to the garden hose adapter, and to the other attach your plastic hose with clamps. Attach the garden hose and run water through it to check for leaks. For a two stage cooler, attach a second smaller coil to one end and place the garden hose fitting on it. Join the two coils with a length of plastic tubing. When operating, place the first coil into a cold bath of ice water and the second into your wort. This will cool the water going into the wort, making your system more efficient. I hope you enjoyed this week’s article on wort chilling. Thank you for joining us on the BeerSmith Home Brewing Blog. Subscribe for weekly delivery or visit our BrewPoll news site to see other brewing and beer news. Have a great brewing week! how do you avoid folding and creasing the copper tubing? You can avoid creasing/folding the copper by wrapping the tubing around a large coffee can, small bucket or corney keg. As long as you choose a cylindrical object with a large enough radius, forming the coil is not hard to do. Don’t forget to pick up a hose thread adapter to easily connect your garden hose to your kitchen faucet! If you live where it get’s cold, your outside pipes may freeze – so you can still effectively chill your wort inside your house in either the kitchen or bathroom! I built a cooler with an extra coil for iced water and it works great !! I can cool 20 liters from boil temp to 15 ºC in less than 20 minutes !! A 90degree bend in soft copper is difficult, it might be better to use a 90 elbow to achieve this. I am currently building my immersion chiller out of 3/8″ OD copper tubing, and I am concerned that once I connect my hoses the weight of the hoses will cause my tubing to bend. Has anyone had problems with their water hoses damaging their chiller tubing? We can provide your industrial application with a complete turnkey solution for your cooling requirement and allow you to spread the cost monthly by renting your equipment. I bought a chiller so when I use it does it have to be sanitized or is that taken care of when it drops in the hot wort? Thanks! Technically you need to leave the chiller in boiling water for some time (15 min or more) while its still boiling to totally sanitize it. However, quite honestly I don’t sanitize mine – I just clean it the dust and junk off before dropping it in the boil. Other opinions on this? A chiller is a machine that removes heat from a liquid via a vapor-compression or absorption refrigeration cycle. This liquid can then be circulated through a heat exchanger to cool air or equipment as required. Brad, I’ve used my home-built immersion chiller twice now. Each time, I’ve done the same as you – given it a good rinse off and dropped it into the boil about 5-10 minutes from the end. So far, so good. My big problem with the immersion chiller is that the copper patinates when let to sit a few weeks/months between brews. The patina is probably not harmful, but I usually take five minutes with some copper polish to clean it up while waiting during mashing. I don’t think the copper patina has any effect as the wort is not acidic enough to dissolve any of it. Shop around for copper prices. It can vary more than 100%. Get spring-style pipe benders when you get your piping, it will make a chiller better looking, better flowing, and allows you to make a more than 90 degree angle which decreases possibility for contamination. Not to mention that it’s insurance against kinking. If you gravity siphon, be careful. The water coming through at first will be about 200 degrees. I made my immersion chiller a few batches ago, and I can’t imagine going back to the ice bath. We are 16 months into brewing, our first batches were partial boils and very easy to cool in an ice bath, when we moved on to full boils & cooling in an ice bath became difficult in the sink as the 30qt kettle was too tall for the sink. We set up a plastic tote/tub with a spigot at the bottom and placed 2 bricks inside for the kettle to sit on (so as not to melt the tub)and filled it with water and ice. The bricks keep the top 2 inches of the kettle out of the ice bath so none gets into the wort. NOW comes the part no one else seems to be doing out there and this is where our ice bath chilling is stepped up to chill 5.3 gallons in 12~15 minutes…We use 2 liter PET soda bottles that have been cleaned & filled with water then frozen, we have 6 of these in the freezer and use 2~4 per 5+gal batch. While the hose is creating a whirlpool around the kettle, we drop 2 of these ‘Ice Wands’ into Star San for 2 minutes and then directly into the wort and handling by the cap stir the wort in the opposite direction as the whirlpool of ice bath water. From flame out to yeast pitch including transferring from kettle to fermenter with an auto siphon is NEVER more than 25 minutes. None of our beers have had any adverse affects from our version of immersion chilling. When our sanke keg mash tun is finished we may be goin stainless immersion chiller to maintain the finish and not even be concerned with any patina as well as the stainless chiller can do double duty as a mash heater in our rubber covered sanke mash tun. Cheers to all! Happy Brewing! I’d like to dispute the idea that you will get DMS and clarity problems unless you use expensive chilling apparatus. I chill by putting the lid tightly on top of my boil pot and leaving it overnight (with a dampened/starsanned towel over the top to make sure it stays on). I transfer to the fermenter the next day once the wort is under 30C, tweak the last few degrees with a couple of ice packs, and pitch the yeast. My wort is clear and leaves all the break material behind in the kettle, the resulting beer is clear and I don’t get any sort of DMS or other off flavours, even in very pale beers. I’ve also never had an infection (but I can see how one might one day happen, never say never). A chiller would speed up the process but definitely isn’t required for clear beer. Step 01: Buying equipment and Ingredients | Adventures of the New Homebrewer!